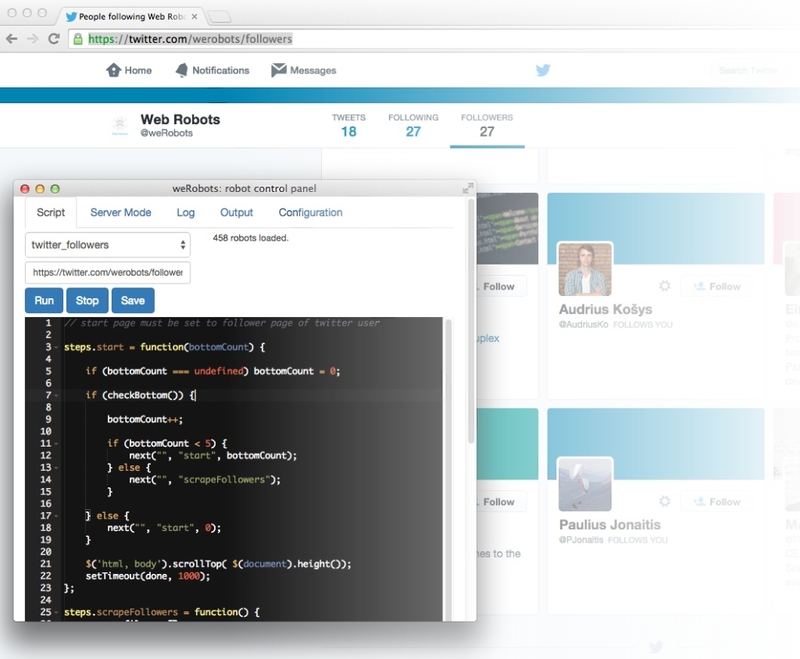 Today we released a simple robot which scrapes follower information from any Twitter user. This will be useful for anyone who is doing competitor analysis or doing research on who follows particular topics. Robot is placed in Demo space on Web Robots portal for anyone to use. Sign in to our portal here. Download our scraping extension from here. Find robot named twitter_followers in the dropdown. Let robot finish it’s job and download data from portal. it does not work for me, it opens a new window. Someone was playing around with the robot code. Remember, it is public – anyone can use it. It may be flaky depending on how responsive Twitter’s infinite scroll data loading is. Is there a way to extend this scraper in order to automatically get “followers of followers”? I would like to generate ego-networks starting from one account (=start URL) and including this accounts followers and their followers and so on (up to a predefined number of steps). The output should then also include a collumn for the user currently in focus (in order to reconstruct the social network).